Illinois catcher Jeff Korte (32) throws to second during the game against Rutgers at Illinois Field on Friday, April 13, 2018. 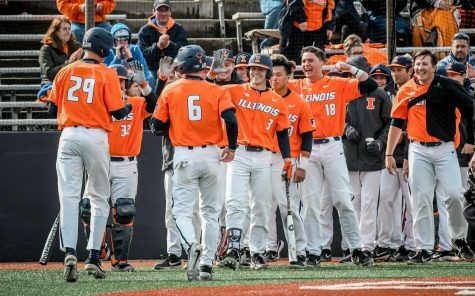 With one of the strongest starts that the Illini have had this season, scoring nine runs in the first inning, the baseball team walked away with a 13-12 victory in the first of the three-game weekend series. 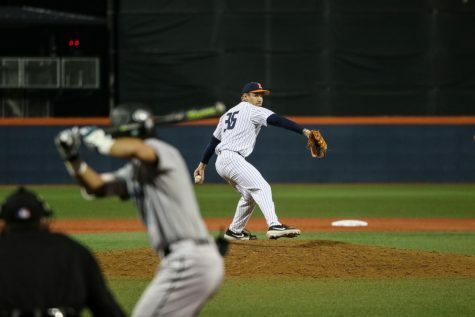 To open up the night, Andy Fisher took to the mound for the Illini. First up to bat was Rutgers’ Mike Nyisztor, who grabbed a single, but a quick double-play ball from Dan DiGeorgio ended the Scarlet Knights’ first inning. 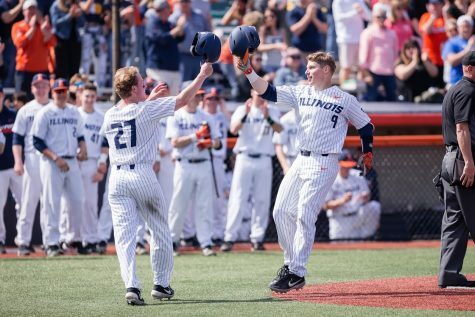 Next, it was the Illini’s turn at the plate, and the bats were on fire. 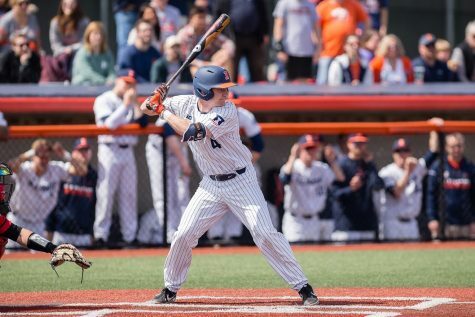 Illinois centerfielder Zac Taylor led things off, sending a ball out of the park on the second pitch he saw to put Illinois up early 1-0. 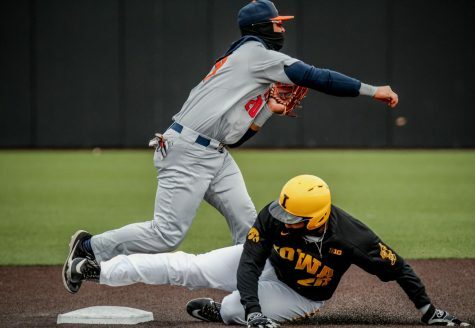 In a hit to the left side by Jack Yalowitz, an already-on-base Michael Massey came around to score, while the Illini’s Doran Turchin, who was on first, advanced to second. 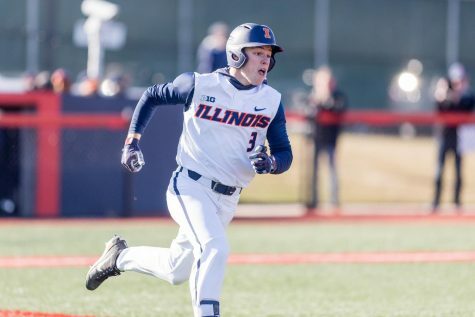 Illinois’ first baseman Michael Michalak drew a walk to load the bases. The designated hitter for the day, Bren Spillane, then hit a triple into center field, clearing the bases to make it 5-0. The score didn’t stay that way long, as catcher Jeff Korte smacked a home run to right field, bringing the first inning score to 7-0. Illinois ran through its lineup with only one out. After two walks back-to-back for third baseman Grant Van Scoy and Taylor, shortstop Ben Troike singled to left field to load the bases once again. Massey, up to bat, then hit an RBI double. 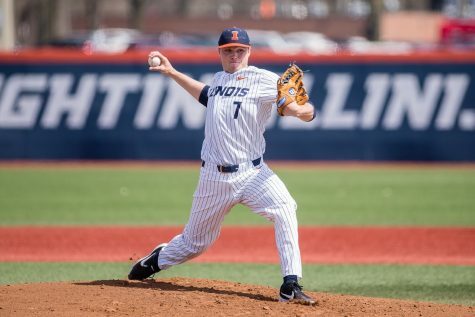 Finally, a Turchin fly-out and Yalowitz groundout ended the first inning with the Illini up 9-0. This was a lead the Scarlet Knights would eventually recover from. 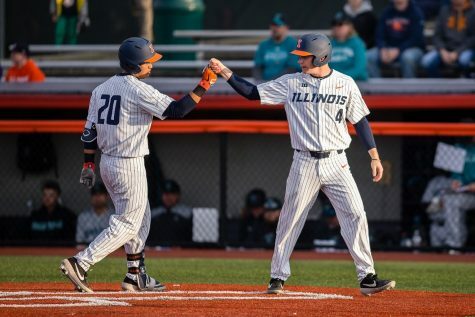 Illinois didn’t allow Rutgers to get on base in the second or third innings at all, but the fourth inning was a different story. With the Illini still up 9-0, an RBI double from Scarlet Knights third baseman Carmen Sclafani got Rutgers on the board. Second baseman Kevin Welsh then followed one batter later, with another double into right field. An error by the Illini and a couple of steals later, the Scarlet Knights cut the lead to 9-7. 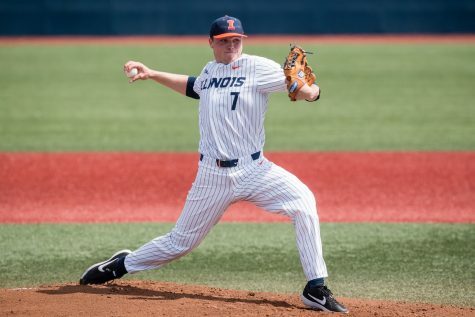 The bases were then loaded for Rutgers, with new pitcher Sean Leland in the game for the Illini. 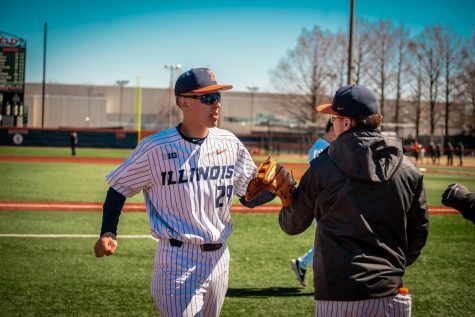 A fresh face on the mound didn’t help the Illini, as centerfielder Jawuan Harris hit an RBI triple for Rutgers to take the lead from the Illini 10-9. Rutgers returned in the fifth inning with a homer by designated hitter Milo Freeman. The Illini didn’t retaliate until the bottom of the sixth, when a Rutgers error caused Troike to score, cutting the Rutgers lead to 11-10. With the bases loaded, Michalak’s fielder choice scored Yalowitz and tied the game 11-11. Korte, with Turchin now standing at third, singled to left field to score Turchin and take the lead 12-11. Ryan Schmitt, on the mound after relieving Leland, allowed a run on a single hit to tie the game back up 12-12 in the bottom of the seventh. In the start of the eighth inning, Ryan Thompson checked in as the Illini’s fourth pitcher of the night. “The game dictated that we needed to go (through) the bullpen,” Hartleb said. The right-handed sophomore only allowed a single hit and no runs. In the bottom of the eighth, Yalowitz continued his hot-hitting day and ended up on base with a single to center. A pitch hitting Mark Skonieczny was then walked, advancing Yalowitz to second. Korte got his third hit of the day and fourth RBI as he singled into right field to score Yalowitz and make the game 13-12. 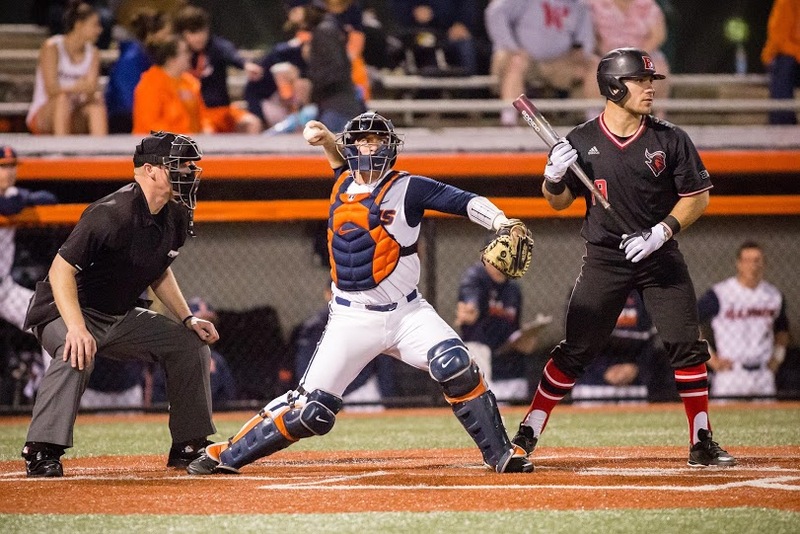 Illinois then turned closer Joey Gerber in the final inning. Living up to his title, Gerber did not allow a single hit to close out the game with a 13-12 victory.